What is The Point in Using Lists on Twitter? 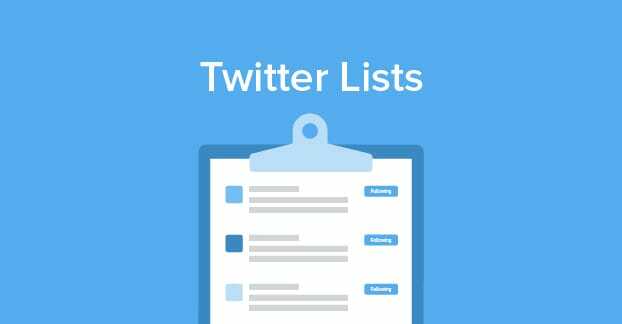 Blog > Twitter > What is The Point in Using Lists on Twitter? Twitter Lists are one of those features that have existed for years but are largely under-utilized. Even now, many of the people using them are doing so in a thin, automated way that doesn’t add much value to anything. It’s perfectly possible to go ahead with Twitter marketing for years without ever touching a list, and it’s perfectly viable to continue doing so. I won’t say that using lists will make a huge difference in your marketing strategy. What I WILL say is that they can be quite valuable in the right context and with the right purpose. I’ve put together a list – ha ha – of different purposes you might use lists for. If any of them seem compelling, well, have a go at it. The worst that can happen is you ignore it and forget about it. Creating a list is incredibly simple. All you need to do is go to your profile on Twitter. Click on the Lists tab up at the top, and then click to create a new list. It’s off on the right sidebar, if you don’t see it. When you make a new list, you can make a name for the list, a description of the list up to 100 characters, and choose whether the list is public or private. 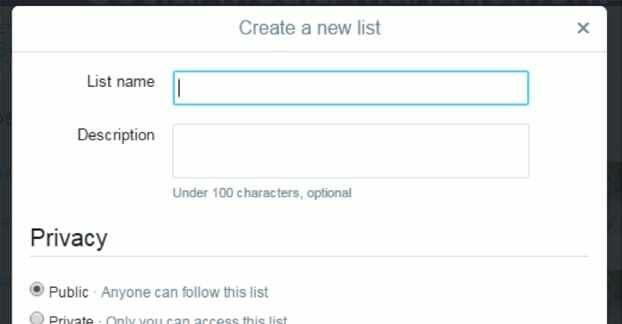 You don’t need to worry about a unique name for the list, since lists are per-profile. Two people can have the same “Awesome Folks” list, and they’ll have different URLs. One will be twitter.com/profileA/lists/Awesome-Folks, and the other will be the same thing except ProfileB. Once you have a list made, you can add people to the list by clicking on the “more actions” button, the three vertical dots, from the user’s profile. You can choose the list or lists you want to add someone to with a checkbox. Submit it and you’re good to go. First of all, if you’re on a list you don’t want to be on, you can’t just remove yourself from the list. You will need to block the person who owns the list. Blocking the person will remove you from their lists. You can then feel free to un-block them if you like; you won’t be re-added to the list. On a technical front, lists have a few hard limits. First of all, you can only have up to a maximum of 1,000 lists on your account. 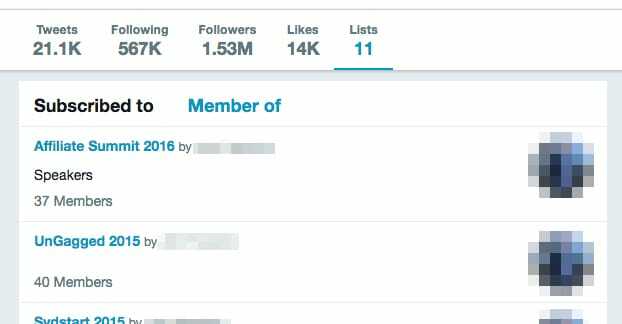 I don’t know how you would even go about coming up with 1,000 unique lists of people you would care about following, but there it is. 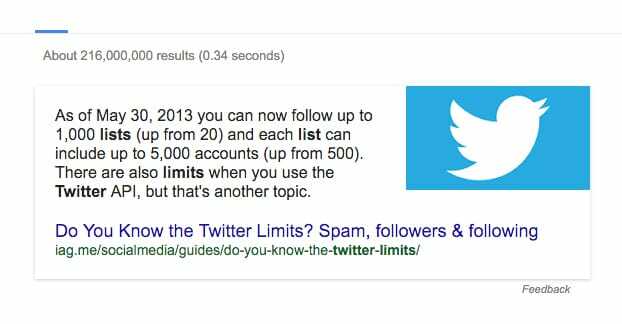 Twitter just made the limit overkill because the previous limit of 20 was far too small. Each list can have a maximum of 5,000 people added to it. This is a more relevant limitation, since there are certainly going to be times where you’re capable of adding that many people to a list and still have it be relevant. You can add protected accounts to a list. However, this does not make their tweets visible to everyone; only people who are allowed to follow the protected account will see those tweets in the list feed. There’s only one major difference between a public list and a private list. When a user is added to a public list, they are notified. Public lists are visible to anyone who has the URL of the list, or anyone who is linked to the list. Public lists are searchable as well. Private lists have none of that. They are for your use only; no one else can see them, even if they have the URL. Private lists do not notify the user when they are added to the list, and they do not appear in search. Otherwise, they follow all of the same limitations and rules. In case Twitter decides to change any of these rules or policies, you can see their actual help documentation about lists here. So what possible use are lists to you, as a brand marketer? Let’s look at some options you have for using them. Remember, with 1,000 lists available to your account, you can implement all of these many times over and still have room. A the most basic level, lists are excellent for organizing a disjointed pile of incoming data streams. This is especially true if you’re the kind of marketer that follows anyone who follows you. I know this isn’t necessarily great for your ratio, but if it works for you, I’m not going to complain too much about it. I like to maintain lists that cross the boundaries between people I want to follow and people I don’t. Here are some ideas of how you can segment your data streams with lists. Make a list of news feeds from major news agencies. The local news, the New York Times, HuffPo, and so forth. With all of them in one list, you can scroll through it at a glance and get a decent idea of what’s going on in the day and week. Make a list of influencers whose content you want to see but who you don’t want to directly follow. Maybe you want to save that actual follow for a more pivotal moment, or maybe you just want their content segmented off to the side. Accounts like, say, William Gibson’s are far too active to keep as part of a central feed if you want to actually use it. Make a list of potential customers you want to reach out to in the future. Following them isn’t going to help your cause, but adding them to a list helps you keep track of whether or not you’ve reached out. These are all good for private lists. If you’re wondering whether or not to use a private list, just think; does the user being notified bring me any benefit? If not, use a private list. Adding someone to a public list notifies them, and can be used as a form of influencer marketing and networking. When you have a flattering list, something like “Cool People” or “Badass Marketers” or “Excellent Writers”, it’s flattering to be added to that list. The person you add is likely going to check you out, and if they like what they see, maybe they’ll shoot you a follow. At the very least, they won’t bock you to remove themselves from your list if they like what they see. The caveat to that is tricky. You need to actually make worthwhile lists, maintain them, and have some air of authority to them. I couldn’t go create a brand new Twitter account, make a list called “Cool Folks”, and add 5,000 people to it and expect to grow. Chances are, most of those people aren’t going to give me a second glance or feel like my list has any authority, because I haven’t built up any reason for them to think so. You also come across people trying to abuse this. For example, this guy has 91 lists, all of which have nearly 5,000 people in them. My test account was added to two of these lists recently, primarily because of a keyword in its bio. None of those lists have any value and are just there as follow bait in a transparent move. Don’t do this. 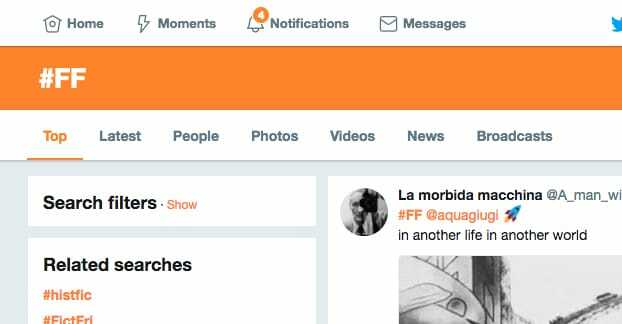 Follow Friday or #FF is a trend on Twitter that has died back in recent years, but which you can still take advantage of if you want. You can build a private list of people to follow who use the #FF tags, which helps you keep track of people you want to follow who will very likely follow you back. Making the list helps you know who to follow rather than just using the hashtag search every Friday. I say to make this private because mutual follows in an exploitive pattern like a #FF tag can be considered a semi-spam technique. Some people get away with it for a long time, while others find themselves the subject of Twitter suspension due to the follower churn or unnatural following behaviors. Keeping the list private helps minimize risk of being flagged as a spammer. You want to use private lists when you monitor your competition. It’s a great way to keep track of all of them without needing to remember a list of every tertiary competitor you might have come across. You don’t want to follow your competitors, for obvious reasons. Adding them to a public list just lets them know you’re keeping track of them, which might tip them off to your presence if they haven’t noticed you. Generally, you just don’t want to provide your competitors with benefit while you’re stalking them. 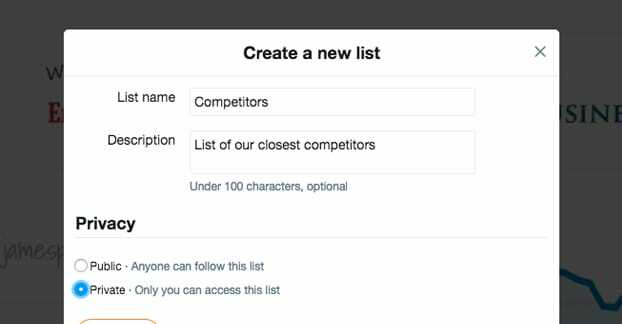 Using a private list allows you to keep track of all of your competition in one place. You can see which ones are tweeting most frequently. You can see which ones are getting the most value out of Twitter. If nothing else, you have the convenient list of names you can use as a jumping-off point for other forms of research, like plugging those names into BuzzSumo or Twitonomy. You can also use a list like this to keep an eye on trends in your industry. If you post something and a few days later see a bunch of your competitors posting about the same topics, you know you’re a trendsetter and you’re ahead of the curve. If you see topics popping up that you hadn’t noticed, you might need to start looking for the data source they’re all using and you’re not. Twitter is just a great tool for awareness. This is another use for private lists. As you employ social listening to keep an eye on your audience, you can add people to lists privately. I like to have about five lists. Satisfied Customers. This is the list of people who have publicly talked about how much they like your product and how they’re satisfied with what you’re doing. This one can even be a public list if you want to recognize influential customers publicly. Customers. This is just a list of people you know are your customers and who haven’t complained about anything, nor have they praised you publicly. It’s just a way to keep an eye on your customers and see if any of them have feature requests or pain points you might want to address. Dissatisfied Customers. This is a list of people who are your customers but who have issues with your service in some way. Maybe they have messaged you for customer service, or maybe they’ve just publicly posted about issues they’ve had. Make a point of keeping track of these people and addressing their issues until you can move them up a list. Potential Customers. This is a list of people who are in your industry or who have expressed an interest in a product like yours, who you might be able to approach on a prospective tweet and offer a free trial of your service. Reaching out for a good opportunity can lead to excellent customers, but you need to time it properly. Ex Customer. This is a list of people who were your customers and who cancelled. Before you do any direct outreach like with list 4, check to make sure the person isn’t on this list. You don’t want to approach someone as if they’re new when they’ll just laugh in your face. Obviously, it can be a lot of work building and maintaining these lists, so customize the plan to your own needs. Whenever you host or attend an event, you’re likely going to be accumulating business cards and friend requests every time you talk with someone. These are all networking opportunities, and you probably want to follow up on them at some point. A public Twitter list is a good way to keep track of everyone, allow them to interact with each other by virtue of being on the same list, and keep track of them later.